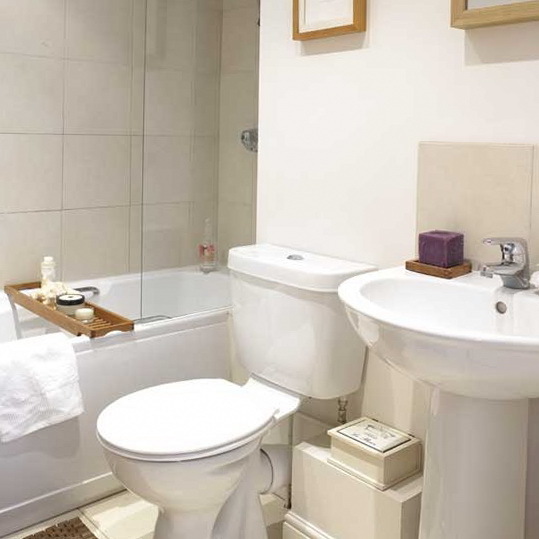 This small bathroom makes the most of space with clever storage hung on the walls. A wire rack holds towels and toiletries, a gilded, wooden wall-mounted stand stores bathtime essentials, and a wicker storage basket is perfect for face cloths and soap. White walls make the most of limited space in this en-suite bathroom by bringing a fresh feel to the room, enhanced by the large skylight. 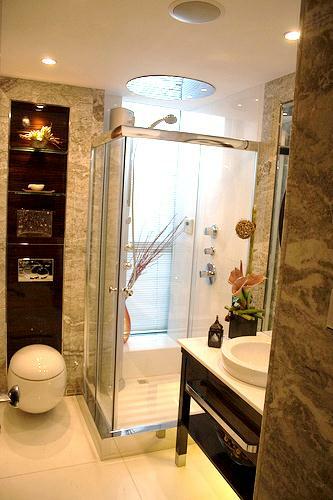 A round shower is tucked into the corner and an extra shelf provides valuable storage space for cosmetics and decorative accessories. A black and white theme creates an instant sense of sophistication. 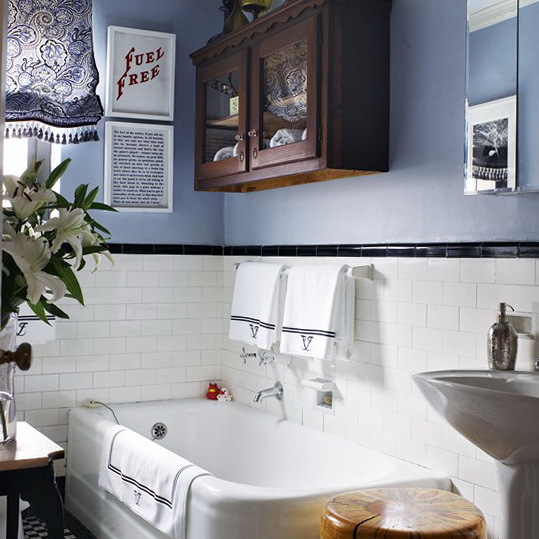 Blue walls give a fresh feel to the original 1920s fittings, which add character to this small bathroom. 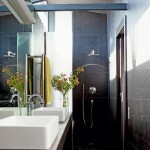 The blue also softens the more masculine features, such as the black dado and stark, white tiles. The combination of white-painted wood panelling and pale blue walls makes this small, beach house bathroom feel deceptively large and open. 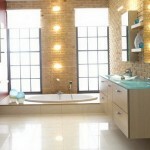 The slipper roll-top bath adds a touch of elegance to the simple scheme. 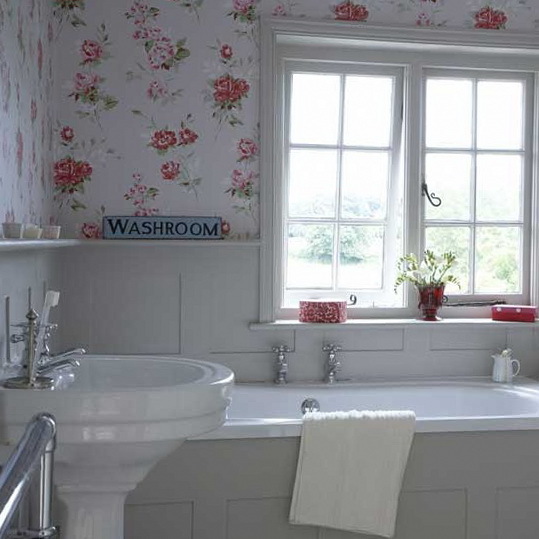 Although an all-white bathroom is the best way to keep a small bathroom feeling spacious, a bold country wallpaper is great for making an impact. 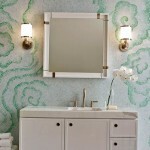 One or two red accessories work as subtle accent pieces, and complement the wallpaper. Recesses in the bathroom walls become designated places to store and display toiletries without taking up valuable space in the room. 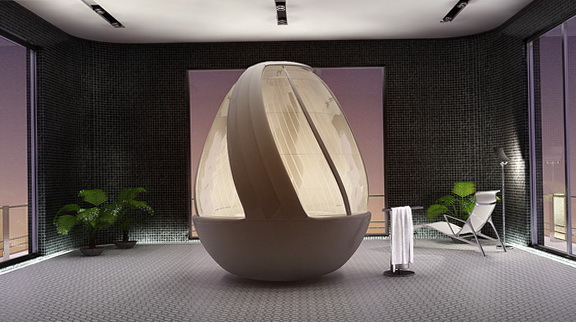 The colourful lighting adds a serene touch to the white scheme. 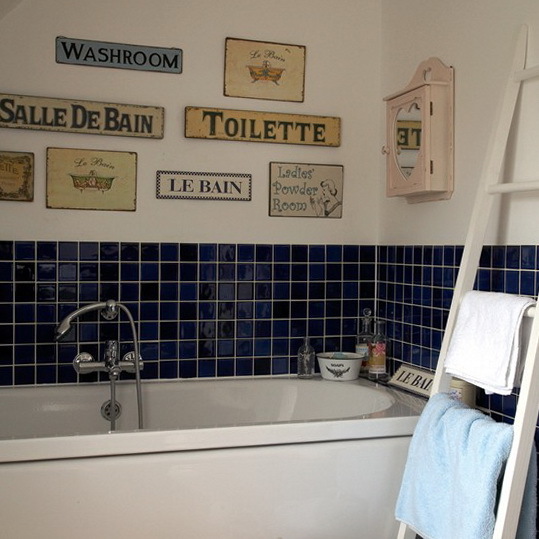 A display of vintage signs and notices adds personality to this small bathroom. 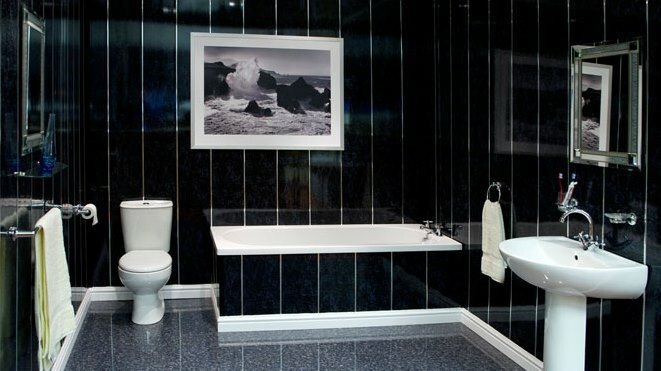 Teaming the dark blue tiles with white grouting, walls and furniture lifts the deep shade, stopping it from making the bathroom seem smaller. With limited space to include decorative bathroom furniture and statement pieces, this roll-top bath creates a stunning focus for the room. 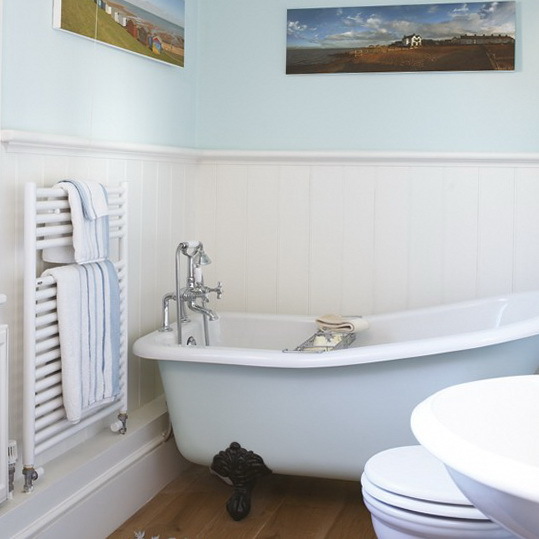 Pale blue panelling and white walls are an understated way to keep the room feeling spacious, whilst allowing attention to be pulled to the bath. 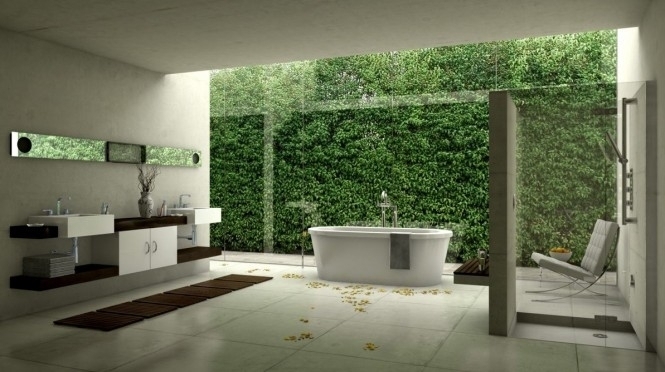 In an awkward bathroom, fitting the bath into the corner is a clever way to use the odd shape to an advantage. 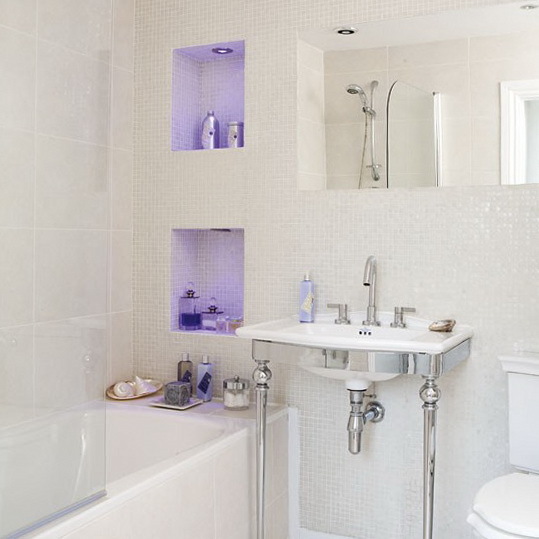 To stop it from feeling disjointed, the use of white furnishings and cream tiles keeps it looking smart. 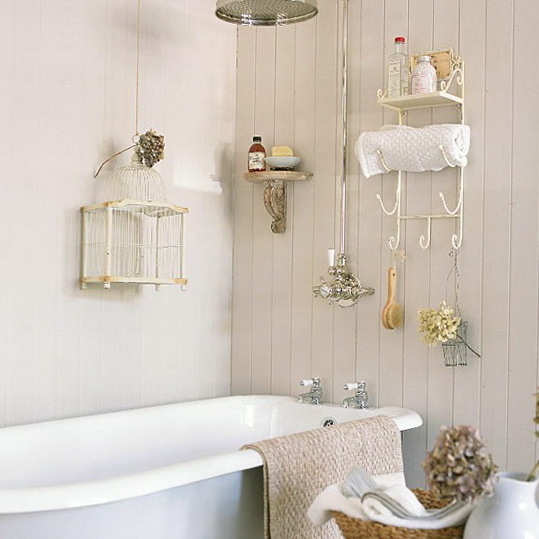 A wooden bath rack adds an extra surface area for soaps and shower gel. 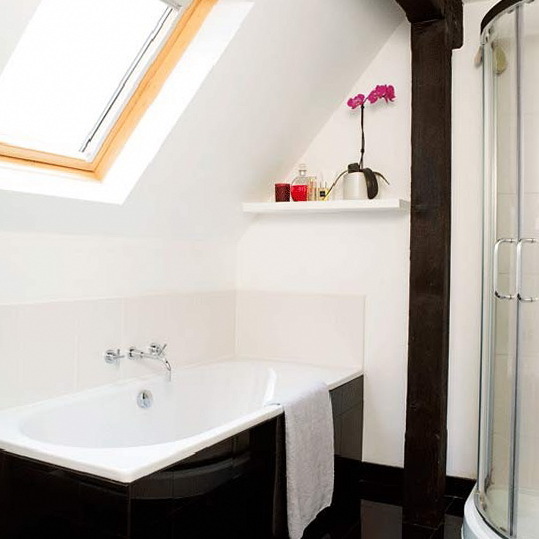 Skylights and white-painted panelling enhance this snug bathroom’s slightly rustic feel. 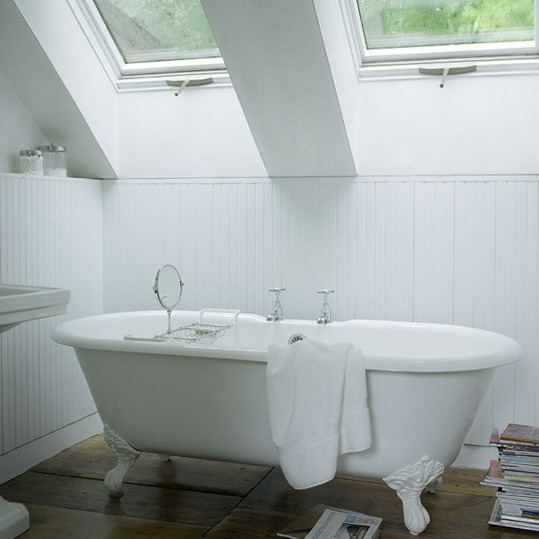 A large freestanding roll-top bath directly beneath the windows suits the period of the old house, as do the traditional taps.